Both of you are running around Virginia, trying to help Democratic candidates get elected in a tough year. Good for you. So you both need to be aware the next time you come to Norfolk just who your friends are. I now live in the 83rd as well, thanks to redistricting. I’m waiting for my new representative to reach out to his new constituents. Wait – he doesn’t have to do that because he has no opponent, right? Even so, I was willing to give Del. Stolle the benefit of the doubt – that he would embrace being responsive to his constituents whether or not they voted for him. Now I’m not so sure. The company you keep and all that. Previous Post Friday fun: snowflake or raindrop? As you should well know Vivian, in politics there are no friends; just allies and enemies. Even that, is on a somewhat temporary basis. I do know. Doesn’t mean I have to like it, though. I read the invitation and I can’t figure out how Randy Wright got to be The honorable Randy Wright. It must be because he was a “Guest Speaker” on light rail in Europe before light rail was here. Oh wait, if he was a “guest speaker”, why did the citizens of Norfolk pay for the trip? Just wondering!! Did Mcauliffe contribute to Randy Wright? If I recall correctly, TMac came to town & did a fundraiser for him. Please come tonight. I would be happy to answer any questions you have. I am also happy to meet with any group from the 83rd district. I value any direct input that would help me better represent all the people of the 83rd. Thanks for the invitation but I seriously doubt I’d be welcome. Glad to hear that you are open to input from all of your constituents. 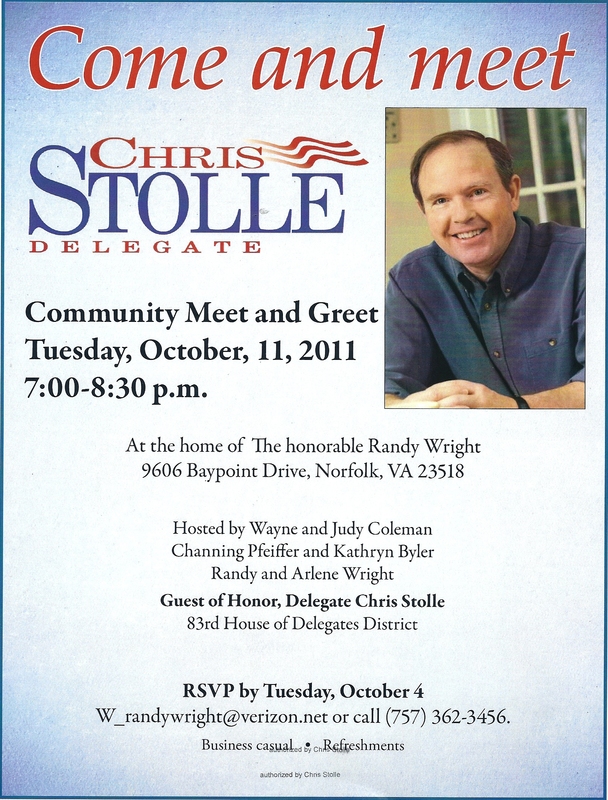 I think you will find Chris Stolle to be a true public servant in the best tradition, who feels honored to serve.